The slope side Private Residences at One Steamboat Place are located in the Gondola Square in Steamboat's Mountain Village. With one bedrooms and a den, Three Forks Mountain Residence is a remarkably private residence offering premier lodging within a world-class resort and spa. The layout gives you the choice of bedrooms and you will benefit from the extra space in the common areas since this residence is designed as a 3 bedroom. It can also be rented as a 1 or 3 bedroom option. Its distinctive location within the building allows you to find the impressive Fitness Facility and Spa simply a few steps from your door. It features a large private deck with great warming sun to enjoy a cup of coffee in the morning. The large open floor plan connects the kitchen, dining and living room creating a free-flowing space at the heart of the residence. Aspiring chefs will delight in the professionally equipped kitchen with Viking appliances and the opportunity to grill in the great outdoors at the built-in Viking gas barbecue grill on the private deck. The adjoining dining area features a handcrafted dining table that beautifully complements the fine workmanship of the contemporary interior. 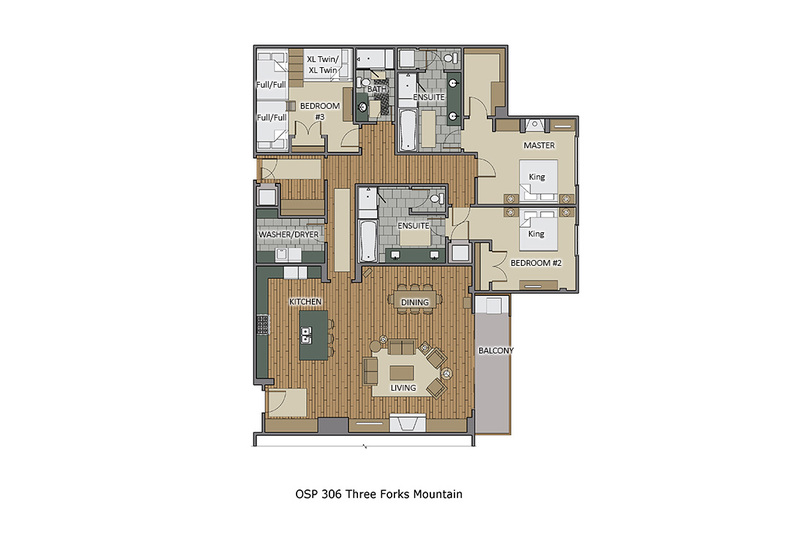 Three Forks Mountain Residence offers a Master Bedroom with in-floor heating, fireplace and an oversized en suite bathroom with steam shower, double sink vanity, rain showerhead, and Jacuzzi tub. You can also choose the Junior Master Bedroom with a private bathroom or the den offers two sets of twin bunk beds and a large closet. The home office boasts an iMac home computer with high speed Wi-Fi allowing Internet service for all guests. A printer is available at the front desk, and guests can also videoconference with the front desk from the home office.